The best marketing communication doesn’t come from the marketing department. It comes from the customer. The language can be eloquent, or unvarnished. Sometimes the communication is non-verbal. Like the fellow who drove up to our house Saturday to look at the 1990 Honda Civic station wagon I’d posted for sale on Craig’s List. He was driving a 1990 Honda Civic station wagon with 240,000 miles on it. Mine, with a mere 80,000 miles, was going to be an upgrade. As it happened, he didn’t get the car. He’d wanted a few days to get an inspection, but I had so many good prospects, I was able to get a substantial cash down-payment from the second fellow who saw the car. To my astonishment, by the time I removed the car from Craig’s List (less than 48 hours after the initial posting), I’d received more than 30 calls. A few were from folks simply looking for a low-mileage car for less than $2,000. 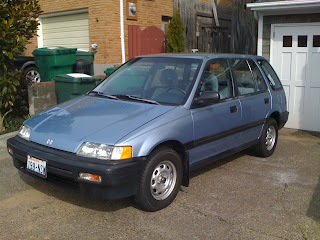 But most were from people who wanted a low-mileage circa-1990 Honda Civic station wagon. When the fellow called from Eureka, California, and wanted to drive up and pay cash, I was a bit surprised. But then I got similar calls from Masschusetts, Texas, and Pennsylvania. And then there were the local folks who offered to pay as much as $150 more than the asking price if I’d return the down payment and sell to them instead. As I chatted with these folks, and put a couple of them into the “back-up offer” category, I discovered they had one thing in common: They all owned, or had owned, a 1990 Honda Civic station wagon. The phone rang as I was writing this, and it was one more prospective buyer, Jim Kerr from Florida. After telling him the sad news that the car had gone on to its next home, I said I just had to ask why on earth he was looking at a car all the way out in Seattle. Oh, and the Honda Civic he’s got now? He’d flown out to Phoenix to buy it, driving it back to Florida. Honda could certainly sell a lot of those Civics if they ever made them again. The Civic itself is the second-longest continuously-running nameplate from a Japanese manufacturer. Interestingly, Honda stopped making a Civic station wagon in 1991, rendering the fourth generation (1988-1991) station wagons like mine instant classics. One of the reasons I’d clung all these years to a car that lacked air bags, lavishing frequent checkups and annual full detailing on it, was that I simply could not find a small, inexpensive car that combined great visibility, proven reliability, station wagon access, and tons of configurable cargo room. The reason I was finally able to let go? 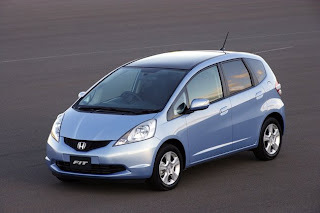 The 2009 Fit. Of course, it’s by Honda. While I wait for my Fit to be delivered this summer, I’ve been fortunately to be able to borrow my mom’s car—a 2005 Honda Civic sedan.